I like to paint and Grady likes to creek fish, so sometimes we go together and do what we both enjoy. This picture was a result of one of those times. We went up to Bethpage (Grady is that where we were?) 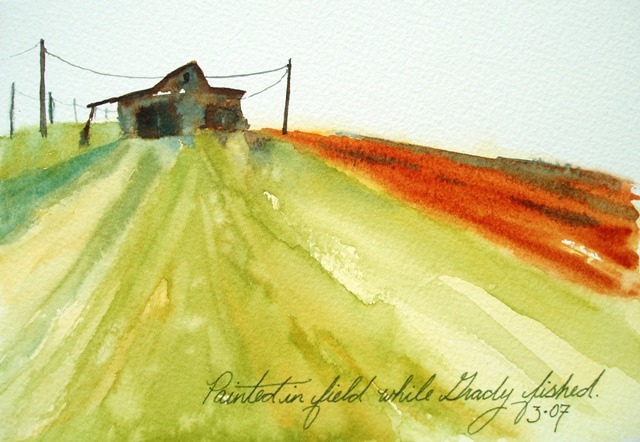 and Grady and Clay (one of Grady’s fishing friends) fished and I plopped down in someones field and painted this field and barn. I really like how the painting turned out – I just wish I hadn’t written on it. Oh well, I guess I’ll always remember where and why I was painting that scene. Sandy, I just came upon your blog for the first time. I am really impressed. Thanks for using your gifts to honor Him and encourage all of us.